E-Mod Explosion parade lap in honor of Noah's Bandage Project. Once again over 100 drivers and race teams settled in to the pit area at Lakeside Speedway for Racing on the River’s Edge for Noah’s Bandage Project Race Night featuring the $1,000-to-win E-Mod explosion. A total of 22 events were ran throughout the evening for the 7 Factory Stocks, 6 Grand Nationals, 18 USRA Stock Cars, 27 E-Mods, 25 USRA B-Mods, and 18 USRA Modifieds on hand. Noah’s family was on hand to honor his legacy and vision to “cool” band-aids for kids when in the hospital. Noah was only six years old when he received his diagnosis and even after his passing his vision lives on to help provide bandages to kids that need them and to help raise funds for local pediatric cancer research. 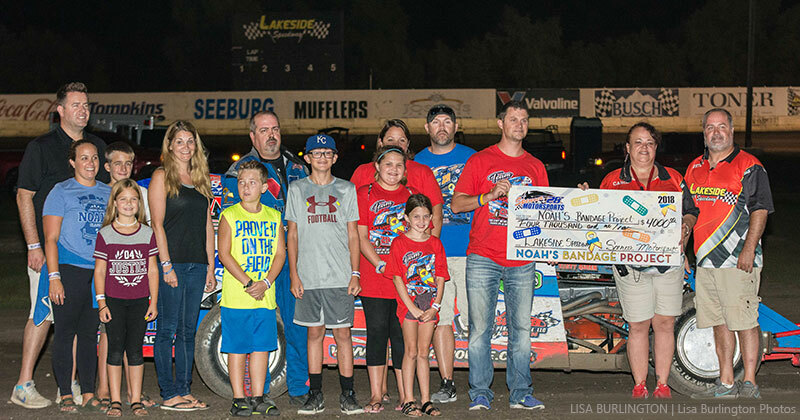 With the help of drivers and fan donations, Lakeside Speedway is proud to announce $4,000 was raised throughout the night for Noah’s Bandage Project! For more information on the project, please visit www.noahsbandageproject.com. 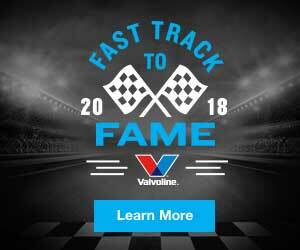 Preliminary events recap: Action began with the Factory Stock heat race as David Nickel led early until point’s leader Marshall Jewett took command at the halfway point and led the rest of the way with Nickel in second. Nick Drew, Jr. and Don Marrs had a close battle for the Grand National heat with Marrs eventually collecting win ahead of Drew at the finish. E-Mods competed in 8-lap heat races to sort out the starting grid of their main event. Jessie Mulich of Bonner Springs, Kansas drove from the back to the front ahead of Anthony Hill in heat one with Eddie Ingram blasting to the front in heat two to take the win over Steven Makar. Ben Stockton advanced from deep on the grid in heat three and went on to victory over a great run by Kit Bailey in second. The final E-Mod heat winner was fifth-starting Billy Spilman who held off a strong charge by Shawn Burns in second. Kevin Anderson used a turns one and two pass on early leader Tim Shields and drove to victory in the first heat for USRA Stock Cars. David Holcomb was a big winner in heat-race two as he easily drove to the win ahead of Michael Pepper. Brett Heeter used a late-race pace to claim the third USRA Stock Car win as he edged Gerald Wahwahsuck. USRA B-Mods competed in four big heats to determine main-event starting grid positions with Patrick Royalty collecting the win over Blaine Yonts in heat one. Tim Powell cruised to an easy win in heat two ahead of Nick Newton while Chad Walker grabbed the win for heat three over Doug Keller. Andy Bryant comfortably won heat four with Jake Richards in second. USRA Modifieds competed in three 8-lap heats with Kerry Davis showing the way in heat one ahead of Terry Schultz. Fayetteville, Arkansas driver Tyler Wolff powered his way to the front in heat two and claimed the win over Nic Bidinger while Justin Johnson collected the victory in heat three over former champion Aaron Marrant. Main events recap: Wayne Brooke led the opening lap trying to make it two in a row for the 10-lap Factory Stock main event before Kerry Ayres advanced forward to lead lap two; however, by lap three it was sixth-starting Marshall Jewett who moved to the front. Jewett ultimately went on to collect his 11th feature win of the year over Ayres and David Nickel. In Grand National action, Kacey Shields was strong from the drop of the green flag and captured his sixth win this year with Don Marrs and Terry Bivins second and third. The 20-lap, $1,000-to-win E-Mod Explosion event began with Eddie Ingram and Jessie Mulich on row one. Ingram paced the first two laps before Ben Stockton made his way to the front by lap three. Ingram went back to the front at lap six; however, after a lap 11 caution, Stockton powered his way back to the front. A final late-race caution forced a green-white-checkered flag finish due to the race exceeding the main event time limit of 25 minutes. In the end, Stockton recorded his second win of the year with Mulich holding strong in second and Billy Spilman third. The Smokin’ Hot Summer Series action for the USRA car classes came to an end on Friday with USRA Stock Cars and their 15-lap main event. Tim Shields led the event through lap five and a series of cautions before Brett Heeter was able to move forward from sixth to first and ultimately become a nine-time winner. Shields finished a strong second with Steve Herrick third as both drivers registered their best finishes of the season. For USRA B-Mods, Patrick Royalty and Andy Bryant led the field to green-flag racing. By a lap-six caution Bryant had separated himself from the rest of the field leaving Tim Powell and Royalty to settle in behind him. In the end, Bryant prevailed in the quick-pace race and turned laps close to the 19-second bracket to claim his fifth victory of the season over Powell and Royalty with Brad Smith advancing from 14th to 4th at the finish, Jake Richards was fifth. USRA Modifieds finished up the night’s action with Kerry Davis of Parkville, Missouri and Terry Schultz of Sedalia leading the field into turn one. Davis was completely hooked up from the onset and set a torrid pace at the front with a lap of 19.584 seconds around the big and wide sweeping turns of the speedway. By lap 10, Davis had checked out leaving Darron Fuqua and Tyler Wolff to battle for second over the first half of the race. A mid-race caution bunched the field but once again Davis checked out on the rest of the field and went on to collect a dominating win with Wolff coming away second, followed by Fuqua, Chad Lyle and Schultz inside the top five. The Noah Wilson family accepts the a $4,000 donation from Lakeside Speedway for Noah's Bandage Project. Up Next: Friday, August 17th is the 3rd Annual Grant Junghans Memorial, featuring USMTS Modifieds, USRA Stock Cars and USRA B-Mods. Pit Gate Opens 4 p.m., Spectator Gates Open 5:30 p.m., Drivers Meeting 7:00 p.m., Hot Laps 7:30 p.m., and Racing at 8. For additional information visit the USRA website at www.usraracing.com. Fans can call throughout next week to reserve tickets for the blockbuster event. Pre-ordered tickets will be available at the Will Call window on race day at the track. Lakeside Speedway wishes to remind drivers that reserved pit stalls are not applicable for the event next weekend! 2. (3) 90 Terry Schultz, Sedalia, Mo. 5. (1) 12V Nathan Vaughn, Sedalia, Mo. 6. (6) 23 Justin Rexwinkle, South Coffeyville, Okla.
2. (5) 3B Nic Bidinger, Perry, Kan.
3. (2) 16S Chad Lyle, Oak Grove, Mo. 5. (1) 7d7 Kyle Covert, Topeka, Kan.
6. (6) 33C Cole Moore, Kansas City, Mo. 1. (1) 7J Justin Johnson, Olathe, Kan.
2. (2) 70 Aaron Marrant, Richmond, Mo. 3. (4) 34 Mark Schafman, Edwardsville, Kan.
4. (3) 13H Eric Hanna, Maryville, Mo. 5. (5) 77 Doug Keller, Easton, Mo. DNS – (6) 4M Manlee Lamar, Polo, Mo. 1. (1) 68 Kerry Davis, Parkville, Mo. 2. (5) 4W Tyler Wolff, Fayetteville, Ark. 3. (7) 87 Darron Fuqua, Mayetta, Kan.
4. (9) 16S Chad Lyle, Oak Grove, Mo. 5. (2) 90 Terry Schultz, Sedalia, Mo. 6. (3) 3B Nic Bidinger, Perry, Kan.
7. (10) 21T Lance Town, Louisburg, Kan.
8. (6) 7J Justin Johnson, Olathe, Kan.
9. (8) 34 Mark Schafman, Edwardsville, Kan.
10. (11) 13H Eric Hanna, Maryville, Mo. 11. (16) 23 Justin Rexwinkle, South Coffeyville, Okla.
12. (12) 1K Tim Karrick, Basehor, Kan.
13. (4) 70 Aaron Marrant, Richmond, Mo. 14. (15) 77 Doug Keller, Easton, Mo. 15. (14) 7d7 Kyle Covert, Topeka, Kan.
16. (17) 33C Cole Moore, Kansas City, Mo. 17. (13) 12V Nathan Vaughn, Sedalia, Mo. DNS – (18) 4M Manlee Lamar, Polo, Mo. 1. (2) 417 Kevin Anderson, Kansas City, Mo. 2. (1) 42T Tim Shields, Kansas City, Mo. 3. (5) 75B Cletus Murray, Kansas City, Mo. 4. (6) 1 Austin O'Neal, Kearney, Mo. 5. (3) T2 Tom Fogarty, Olathe, Kan.
6. (4) 12 Scotty Moore, Kansas City, Kan.
1. (1) 46 David Holcomb, Kansas City, Kan.
2. (5) 22P Michael Pepper, Lakin, Kan.
4. (6) 6 Hank Thompson, Olathe, Kan.
5. (2) 25C Kyle Courtney, Kansas City, Mo. 6. (4) 8Y Rieli Yonts, Leavenworth, Kan.
1. (4) 5 Brett Heeter, Louisburg, Kan.
2. (2) 11W Gerald Wahwahsuck, Atchison, Kan.
3. (6) 91J Jaylen Wettengel, Topeka, Kan.
4. (5) 5K Steve Herrick, Topeka, Kan.
5. (1) 98 Richard Jameson, Sugar Creek, Mo. 6. (3) 32K Michael Knight, Leavenworth, Kan.
1. (6) 5 Brett Heeter, Louisburg, Kan.
2. (2) 42T Tim Shields, Kansas City, Mo. 3. (12) 5K Steve Herrick, Topeka, Kan.
4. (10) 1 Austin O'Neal, Kearney, Mo. 5. (8) 75B Cletus Murray, Kansas City, Mo. 6. (4) 46 David Holcomb, Kansas City, Kan.
7. (5) 22P Michael Pepper, Lakin, Kan.
8. (15) T2 Tom Fogarty, Olathe, Kan.
9. (17) 12 Scotty Moore, Kansas City, Kan.
10. (13) 98 Richard Jameson, Sugar Creek, Mo. 11. (9) 27 David Oxford, Platte City, Mo. 12. (11) 6 Hank Thompson, Olathe, Kan.
13. (1) 91J Jaylen Wettengel, Topeka, Kan.
14. (3) 417 Kevin Anderson, Kansas City, Mo. 15. (7) 11W Gerald Wahwahsuck, Atchison, Kan.
16. (14) 25C Kyle Courtney, Kansas City, Mo. 17. (16) 32K Michael Knight, Leavenworth, Kan.
DNS – (18) 8Y Rieli Yonts, Leavenworth, Kan.
2. (1) 16 Blake Pierce, Kansas City, Mo. 5. (4) 47 Tyson Lanfermann, Kansas City, Mo. 6. (6) 10C Christopher Connel, Leavenworth, Kan.
DNS – (7) 3Y Blaine Yonts, Leavenworth, Kan.
2. (2) 3x3 Nick Newton, Kansas City, Kan.
3. (4) 222 Dustin Crist, St. Joseph, Mo. 4. (3) 99 Brad Smith, Belton, Mo. 5. (6) 34S Sturgis Streeter, Topeka, Kan.
6. (5) 81 Austin Charles, Basehor, Kan.
1. (1) 4 Chad Walker, Kansas City, Kan.
2. (6) 7 Doug Keller, Easton, Mo. 3. (5) 8U Rodney Schweizer, Kansas City, Kan.
4. (3) 1 Kyle Henning, Atchison, Kan.
5. (4) 7D3 Ted Martin Pantoja, Topeka, Kan.
6. (2) 73 Tommy Summers, Blue Springs, Mo. 2. (3) 7J Jake Richards, Lansing, Kan.
3. (5) 18 Curt Drake, Moran, Kan.
4. (4) 81x Jacob Blair, Parkville, Mo. 5. (1) H1 Mark Hunziger, Humboldt, Kan.
DQ – (6) 0 Chase Galvan, Bonner Springs, Kan.
2. (3) 57 Tim Powell, Lansing, Kan.
3. (1) 49 Patrick Royalty, Kansas City, Kan.
4. (14) 99 Brad Smith, Belton, Mo. 5. (4) 7J Jake Richards, Lansing, Kan.
6. (24) 0 Chase Galvan, Bonner Springs, Kan.
7. (8) 3x3 Nick Newton, Kansas City, Kan.
8. (5) 7 Doug Keller, Easton, Mo. 9. (17) 34S Sturgis Streeter, Topeka, Kan.
10. (9) 8U Rodney Schweizer, Kansas City, Kan.
11. (22) 81 Austin Charles, Basehor, Kan.
12. (15) 1 Kyle Henning, Atchison, Kan.
13. (7) 16 Blake Pierce, Kansas City, Mo. 14. (12) 181 Luke Nieman, Nortonville, Kan.
15. (19) 47 Tyson Lanfermann, Kansas City, Mo. 16. (16) 81x Jacob Blair, Parkville, Mo. 17. (21) 73 Tommy Summers, Blue Springs, Mo. 18. (18) H1 Mark Hunziger, Humboldt, Kan.
19. (10) 18 Curt Drake, Moran, Kan.
20. (13) 9 Don Marrs, Shawnee, Kan.
21. (11) 222 Dustin Crist, St. Joseph, Mo. 22. (6) 4 Chad Walker, Kansas City, Kan.
23. (20) 7D3 Ted Martin Pantoja, Topeka, Kan.
24. (23) 10C Christopher Connel, Leavenworth, Kan.
DNS – (25) 3Y Blaine Yonts, Leavenworth, Kan.
1. (5) 9 Don Marrs, Shawnee, Kan.
2. (2) 15 Nick Drew Jr., Kansas City, Kan.
3. (4) 42C Kacey Shields, Kansas City, Mo. 4. (6) 5 Terry Bivins, Lebo, Kan.
5. (1) 8 Terry Bruner, Shawnee, Kan.
6. (3) 29 Dennis Melvin Sr., Basehor, Kan.
2. (4) 9 Don Marrs, Shawnee, Kan.
3. (6) 5 Terry Bivins, Lebo, Kan.
4. (5) 8 Terry Bruner, Shawnee, Kan.
5. (2) 29 Dennis Melvin Sr., Basehor, Kan.
6. (3) 15 Nick Drew Jr., Kansas City, Kan.
1. (1) 7 Marshall Jewett, Gardner, Kan.
2. (2) 0.05 David Nickel, Kansas City, Kan.
4. (6) 16 Matthew Matsukevich, Trimble, Mo. 6. (4) 58 Jeff Siler, Kansas City, Kan.
1. (6) 7 Marshall Jewett, Gardner, Kan.
2. (4) 99A Kerry Ayres, Gladstone, Mo. 3. (3) 0.05 David Nickel, Kansas City, Kan.
5. (5) 16 Matthew Matsukevich, Trimble, Mo. 6. (7) 78 Clint Bell, Paola, Kan.
7. (1) 58 Jeff Siler, Kansas City, Kan.
1. (6) 90 Jessie Mulich, Bonner Springs, Kan.
2. (5) 124 Anthony Hill, Lathrop, Mo. 3. (1) 15R Ryan Smith, Moran, Kan.
4. (2) 98 Bryan Smith, Belton, Mo. 5. (7) 3 Loyd Yonts, Leavenworth, Kan.
6. (3) 15E Dakota Earls, Independence, Mo. 7. (4) 3P Patrick Royalty, Kansas City, Kan.
1. (4) 54 Eddie Ingram, Linn Valley, Kan.
2. (3) 4M Steven Makar, Basehor, Kan.
3. (2) 7 Adam Schelert, Leavenworth, Kan.
4. (6) 58 Destyn Whitney, Lincoln, Neb. 5. (7) 25 Tim Billings, Liberty, Mo. 6. (5) 99 Emma Martin, Independence, Mo. 7. (1) 236 Trevor Hand, Bonner Springs, Kan.
1. (5) 33S Ben Stockton, Kansas City, Mo. 2. (1) 77 Kit Bailey, Liberty, Mo. 3. (4) 32 Dennie Belknap, Bonner Springs, Kan.
4. (3) 9 Shaunie Lanning, Kansas City, Mo. 5. (6) 1DER Christopher Wunder, Cleveland, Mo. 6. (7) 33 Jeremy Curless, Grain Valley, Mo. 7. (2) 50 Leroy Morrison, Raymore, Mo. 1. (5) 63 Billy Spilman, Rushville, Mo. 2. (6) 28S Shawn Burns, Overland Park, Kan.
3. (1) 14B Darren Bennett, Tonganoxie, Kan.
4. (2) 54SR Buz Kaster, Kansas City, Kan.
5. (3) 117 Tim Galvan, Kansas City, Mo. 6. (4) 99H Jerry Brown, Hume, Mo. 1. (4) 33S Ben Stockton, Kansas City, Mo. 2. (2) 90 Jessie Mulich, Bonner Springs, Kan.
3. (6) 63 Billy Spilman, Rushville, Mo. 4. (7) 4M Steven Makar, Basehor, Kan.
5. (5) 28S Shawn Burns, Overland Park, Kan.
6. (1) 54 Eddie Ingram, Linn Valley, Kan.
7. (11) 14B Darren Bennett, Tonganoxie, Kan.
8. (13) 58 Destyn Whitney, Lincoln, Neb. 9. (9) 32 Dennie Belknap, Bonner Springs, Kan.
10. (24) 236 Trevor Hand, Bonner Springs, Kan.
11. (15) 54SR Buz Kaster, Kansas City, Kan.
12. (12) 7 Adam Schelert, Leavenworth, Kan.
13. (25) 50 Leroy Morrison, Raymore, Mo. 14. (26) 33 Jeremy Curless, Grain Valley, Mo. 15. (3) 124 Anthony Hill, Lathrop, Mo. 16. (23) 99 Emma Martin, Independence, Mo. 17. (21) 15E Dakota Earls, Independence, Mo. 18. (16) 9 Shaunie Lanning, Kansas City, Mo. 19. (20) 117 Tim Galvan, Kansas City, Mo. 20. (14) 98 Bryan Smith, Belton, Mo. 21. (8) 77 Kit Bailey, Liberty, Mo. 22. (22) 99H Jerry Brown, Hume, Mo. 23. (18) 25 Tim Billings, Liberty, Mo. 24. (10) 15R Ryan Smith, Moran, Kan.
25. (17) 3 Loyd Yonts, Leavenworth, Kan.
26. (19) 1DER Christopher Wunder, Cleveland, Mo. DNS – (27) 3P Patrick Royalty, Kansas City, Kan.